An incredibly rare Blanville’s whale was found at Kenneggy Beach, near Praa Sands on the 30th December 2013. 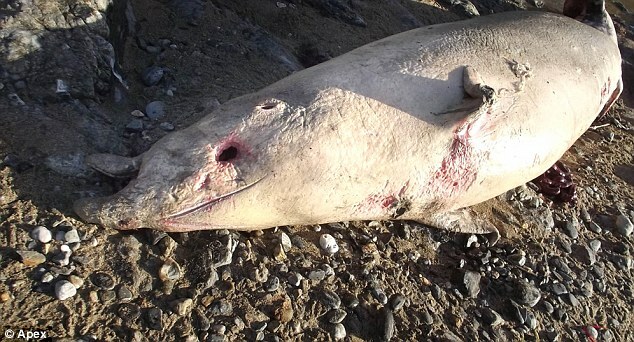 The 3.8 metre long whale was reported to the Cornwall Wildlife Trust Marine Strandings Network as a porpoise, but when the Network’s volunteer, Syd, went to record theanimal that it was suspected to be something different. The Networks data officers were suspicious that it was in fact a rare beaked whale only recorded twice in the whole of the UK. The whale’s identity was confirmed by cetacean experts Colin MacLoud at Aberdeen University and Richard C. Sabin from The Natural History Museum as a sub-adult/maturing male Blainville’s beaked whale.